I collect into one file my 3ds objects I maked in Win3ds app. It was reconverted to 3ds pormat using some software because my 3ds format routines are not enough compatible with other apps. win3ds12. I added shading point light dependent. Also shade calculation (in this shading model). I maked button to random plane obliquity (on which shadow falls), and random point light position. I remove bug (rather serious) in triangulation procedure. Take it and be happy. 1 After projection we sort all triangles (faces) by Z coord, but only in painter algorithm. In Zbuffer algorithm we dont need to sort. 2 I dont know what you exactly mean. 4 ...both sorts (z and y) are completly diffrent. In completly separate places in app. 5 I hope, I help a bit. this is very good ! win3ds13. I added editing objects by vertex, face or edge option. Just use yellow handlers, mouse and its left button (after pressing "edit mesh." GUI button). win3ds14 - in this version I added posibility to teslate triangles only from chosen area also define height of displacement "bumps" option. I divide drawing triangle process into two separate threads. Object "Cordis_Christi.3ds" I reedit using new win3ds13 and win3ds14 features is included in package. Win3ds15 - I implemented rendering bezier patches. For now in viewer there are three predefined objects: tea pot (32 patches), tea cup (26 patches) and tea spoon (16 patches) - 'bezier sr.' GUI button. Displaying derives as a option - 'b. derives' button. Win3ds16 -> I add new rendering model - Phongs shading - interpolation and normalizing normal vector in every pixel. All calculations done on single precision floats. Also I add trinagulation and displacement faces only with positive z cooficient of normal vector as option. Some computing are now divided to threads (I doubt it is succesful). Comments, critising and any other feedback desired. Win3ds17 - I made two new rendering models - texture with bilinear filtering + Phong shading parallel (for now only one light is supported in this model) and glass like rendering. In glass model I tried implement stencil buffer, but it not works correctly. I entered also removig unused vertices option - some objects, I done need it (ring2.3ds, form3.3ds), avialable to download from my site in the past (now are changed for new, corrected versions). I add new procedure searching non redundand edges too. Now not only two (for one triangle), but all edges are displayed (in edge rendering models). I tried refresh and tidy code (files grd_cat.inc, grd_tex.inc), but inspite of mine effort still terribly mess is in code. Win3ds18 - I add multi segment, based on bssplines and Bezier curves, pipes editor and renderer. More questions - see readme.txt file in package. moreover they dont run full corectly. Theree is also option to scale and translate +/-XYZ new object independent to old existing. I'm not sure what you mean? return to os, stop rotary? There is the GUI button that swich beetwen stop / run animation. Or maybye you talk about key on keyboard? Anyway app is very buggy and some causes perform to stop app and return to os. Some gui buttons work slow (not valid algorithm, so some fuinctions need fast machine). 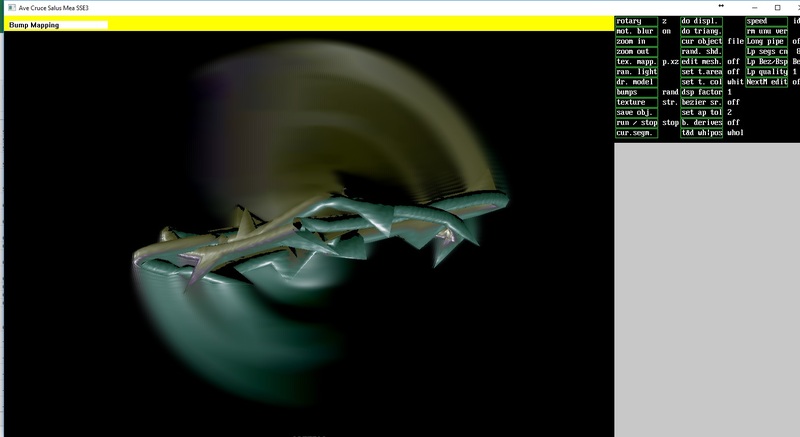 Yes I know there is problem with motion blur in win8 or maybye 10. Unfortunetly at now I havent acces to any win8/win10 machine so I cannot test it. I dont know its a driver problem. App uses only such "advanced" os functions as BtitBlt, and StrechDIBits so driver should thet work without a chitch. Or maybye I am wrong? At last thanks for your feedback. Good luck! Motion blur works on Win10, liking the bump mapping too! If there's anything else you want to test out on Win10, I can probably help. Nice demo, over the years ideas of avcabalero,applemacgub ;) and tthsqe bring me inspiration in efforts to script that, to be done in a years, amen! You are keen of my apps since years. Two new rendering models: non weighted / weighted transparency with layers depth buffer. Gouraud lines now full sse. Also I remove motion blur bug - alignment problems in some resolutions. I tried implement depth peeling procedure (or something like that). New feature has packed depth buffer (in comparing to non packed buff in "weighted transparency" rendering model). I add removing redundand vertices option. See sources. Good luck!. 1. For every pixel - count all pixels on every depth layer (level}. 2. For whole screen - Count all pixels, who will rendered, on every depth layer. 3. Allocate memory for all pixels, who will rendered. Dword for every pixel. 5. Render faces according to buffers and render model (I used Phong + texture). 6. Free previously allocated memory.